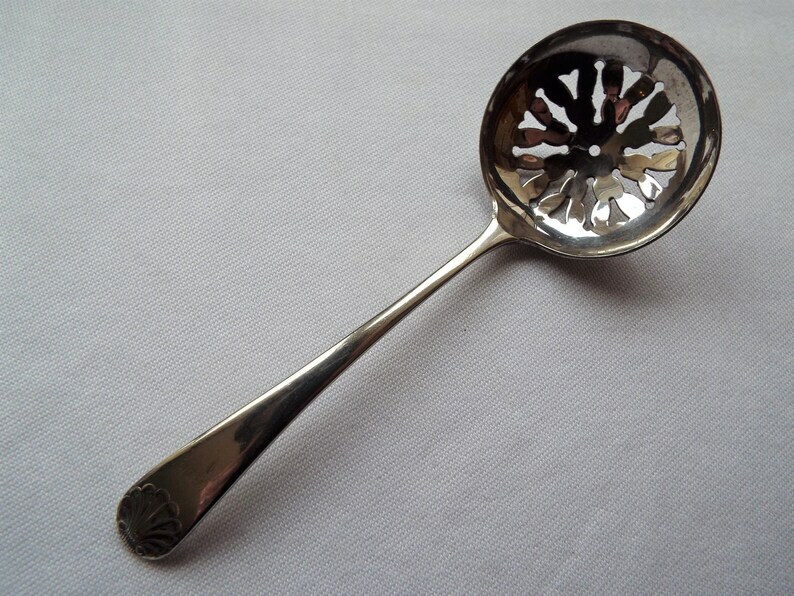 A pretty silver plated (EPNS) English powered sugar sifter spoon with a pretty cut out design in the bowl and a dainty handle decorated at the top with a little scallop shell motif. There is no maker's mark, but it is stamped 'EPNS' (electro-plated nickel silver) and probably dates to around 1930s. The curved handle is perfect for its originally intending purpose of sprinkling powdered (icing) sugar over pretty tea party cakes, or berries such as strawberries. This spoon would also display beautifully in a cabinet or sideboard filled with pretty vintage china tea sets and other pretty vintage things. A perfect gift for an afternoon tea fan, it would also make a lovely small thank you gift to someone special. 11.7cm (4 5/8 inches) in total length from spoon bowl rim to handle tip (approximate). In good vintage condition. There are some areas of a little wear to the silver plate, but this is commensurate with age and use. It is still shiny and bright and even colour. Any further wear there may be is commensurate with age. Your spoon will arrive carefully packaged and beautifully wrapped in vintage style brown paper and ribbon. I will always combine postage in the most cost effective way for purchases of multiple items and refund any postage overcharge, should one arise. Please read my shipping policies before ordering. Vintage linen tablecloth, square floral tablecloth. Hand embroidered flower baskets on a white tablecloth. Ideal for an afternoon tea party! Antique Jam Spoon. Edwardian silver plated preserve spoon, beautifully engraved. Perfect for scones and jam at an afternoon tea party!